Kinan Azmeh has a new album out this week called Uneven Sky, which explores the concept of home. 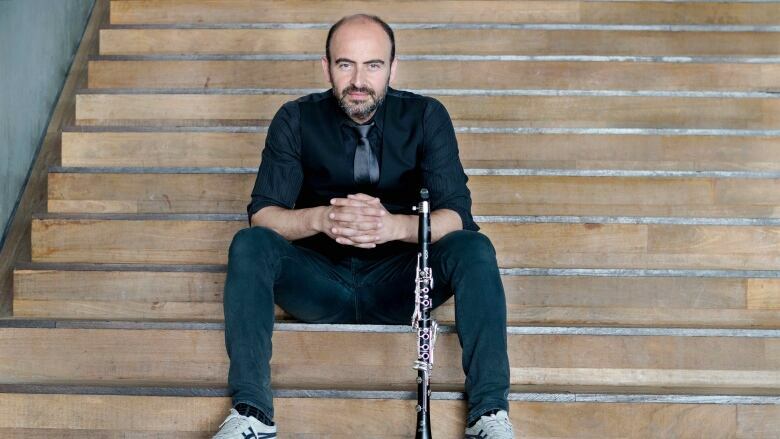 Kinan Azmeh is an acclaimed clarinetist from Damascus, Syria who's a part of Yo-Yo Ma's Silk Road Ensemble. He has a new album out this week called Uneven Sky, which explores the concept of home. Azmeh's own idea of home is complicated by the fact that he lives in New York. He first moved to the city a week before the Sept. 11 attacks, which was an experience that instantly changed his sense of self. Since then, he's lived through President Donald Trump's travel ban — but his reaction to it wasn't what you might expect. "During that very specific moment is when I felt the most at home in New York," Azmeh told q's Tom Power. "Especially when I learned of all the people who went to [JFK airport] to demonstrate the ban... I felt I belonged to a community. These were people who went to JFK to defend the rights of other people and to protest a decision that did not affect them personally. And for me, that's really what a community does." Click 'listen' near the top of this page to hear the full conversation with KinanAzmeh.